Shame it's not an election year. 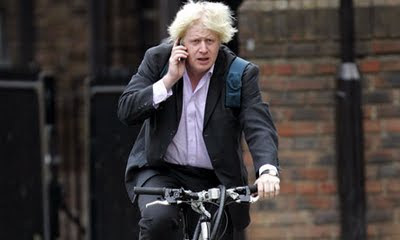 Boris Johnson, Mayor of London, [pictured] is credited with coming to the rescue of a woman being threatened by three youths. They were threatening her with an iron bar when Mr Johnson, who was passing by on his bicycle, rolled up scared them off. "The mayor of London was cycling through Camden, north London, on Monday night when he answered the cry of Franny Armstrong, a documentary maker and environmental activist who was surrounded by a group of hoodie-clad young girls. Johnson stopped and chased the girls down the street, calling them "oiks". He then returned to walk Armstrong home. "He was my knight on a shining bicycle," she said today." Full article from The Guardian here. Thanks to Adrian for the link.